The Monstrous Regiment of Women: Sappho of Lesbos: The "Tenth Muse"
Sappho of Lesbos: The "Tenth Muse"
Today's post on Sappho may seem oddly dated--but we know so little about the life of this renowned lyric poet, and we have no definite dates. 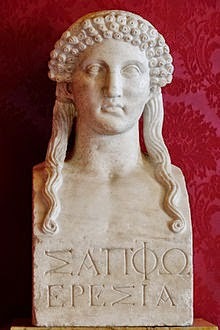 The Greek poet Sappho was likely born around 620 BCE (dates range from 630 to 612), and she seems to have lived into the mid sixth century BCE--perhaps to around 550. All we really know about Sappho is found in her poetry--and even that is mostly fragmentary. 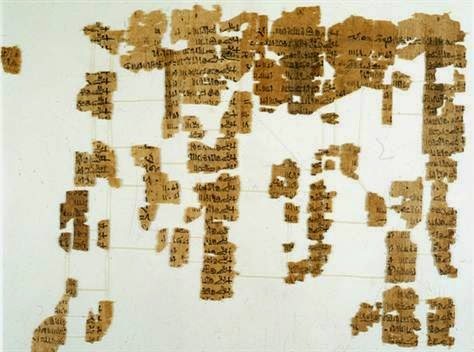 The great Library of Alexandria had nine books of Sappho's poetry, organized by the kind of metrical patterns in the lyrics. Today, only one complete poem survives, the "Hymn to Aphrodite," usually labeled as Fragment 1. Fragment 16, "Some Say," is about twenty lines. needing but little to die. But all must be endured, since. . . .
Aside from Sappho's hymn addressed to Aphrodite and a handful of extended but incomplete poems, the remaining poetry is fragmentary, sometimes just a word or phrase. In modern editions, all of the fragments together number about 264. Just recently, another large bit of fragment has been recovered--its discovery was made in 2014. I've already had my little rant about Plato's reference to Sappho as the "tenth Muse" elsewhere on this blog--so I'll restrain myself here and just provide a link in case you want to see for yourself . . . We'll also see this "praise"--she's the "tenth muse"!--several more times, later in the year. There's a nice overview of Sappho at the Poetry Foundation website. But, more important than reading about Sappho, read some Sappho today!! !